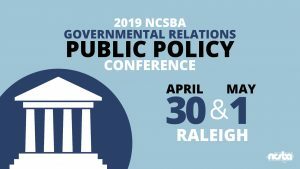 The NCSBA Legislative Public Policy Conference is scheduled for April 30 and May 1 in Raleigh at the NCSBA building. Click the agenda button below to view our modified conference schedule. This bill would exempt a low-performing school from the required opening and closing dates for three consecutive school years following the year that the State Board of Education identifies the school as low-performing. This bill would redirect approximately $37 million of the $47 million allotment for Classroom Materials/Instructional Supplies/Equipment. This $37 million would be used to reimburse teachers up to $400 for purchasing their own classroom supplies. Teachers who spend at least 70% of their work time in classroom instruction related to their graduate academic preparation in their field within their area of licensure. HB 890 is identical to SB 28. This bill would require the State Board of Education to integrate education on the Holocaust and genocide into English and social studies courses and develop curriculum for a Holocaust Studies elective. This bill would require the State Board of Education to adopt rules excusing absences for students attending a legislative event or visiting the NC General Assembly. This bill would allow 16-18-year-old youth to participate in supervised, practice experience in an occupation that is declared to be detrimental to the health and well-being of youth by the Commissioner of Labor. This bill would allow the Superintendent of Public Instruction to approve private activity bonds used to finance a charter school facility. This bill would allow LEAs to have control over student discipline polices that are consistent with federal law. Each LEA would report their most current copy of student discipline policies to DPI no later than September 1 of each year. This bill would provide $500,000 each year of the FY 2019-21 biennium to establish UPSTART, a virtual early learning program for preschool age children. 3. clarify that out-of-state teachers without evidence of effectiveness can earn a continuing professional license after three years of teaching in North Carolina. This bill would provide 30-minute duty-free lunch to full-time assigned classroom teachers starting in the 2019-2020 school year. This bill would direct the State Board of Education to reclassify and establish positions related to school transportation. The Committee adopted a new version of the bill that changed Section 3 from a revision of salary grades and ranges of school transportation positions to a survey of LEAs to determine the cost of such salary revisions. This bill would allow teachers who retired on or before February 1, 2019 to return to work in certain high-needs schools without adversely impacting their retirement benefits. This bill would make various changes to the North Carolina Read to Achieve Program. This bill would eliminate the NC Final Exams, require reporting on and reductions in local testing, and require a review of the third-grade reading End of Grade test to ensure alignment with the Read to Achieve assessment. The Education Cabinet met this Wednesday to discuss My Future NC, the Early Childhood Action Plan, longitudinal data sharing, and the NC Careers website. Presentations on each topic included progress made thus far and plans for the future. My Future NC is pushing their goal of ensuring that 2 million North Carolinians obtain a high-quality postsecondary degree or credential by 2030. The Early Childhood Action Plan continues to promote physical health, safety, nurturing relationships, and educational success among babies, toddlers, and young children. The longitudinal data sharing system is aiming to analyze students’ journeys following graduation. The NC Careers website will be a tool designed to help students make more informed decisions regarding post-secondary education, internships, scholarships, and careers. Governor Cooper closed the meeting with a call for collaboration among the cabinet members and their departments to achieve the ambitious goals of each of these projects. Wednesday, April 3 was the Senate deadline to file statewide bills and resolutions. Below are several notable bills that were filed. Many of these bills have significant implications for the operations of school districts. It is critical that school board members become knowledgeable about how these bills will affect their respective school districts and begin communicating with their Senators about them. Section 1 would grant counties the authority to appropriate capital funds to charter schools. Section 2 would allow counties to use funds awarded from the Lottery’s Need-Based Public School Capital Fund for charter schools. Section 4 would change the academic standards for charter school renewals so that it must be renewed for 10 years unless the Proficiency of students in the charter school is at least 5% points lower than the LEA in which it is located. Section 6 would allow up to 50% of the charter’s enrollment to be children of permanent employees of a corporation or consortium of corporations that contributes $50,000 or more towards land, space, renovations, or technology. Section 7 would authorize the community college board of trustees to be initial authorizers of charters. Section 8 would remove the cap on enrollment growth for the two virtual charter schools. In summary, LEAs transferred $19,332,756 into classroom supplies in FY 2017-18. It is important to note that in addition to classroom materials, instructional supplies, and equipment this allotment is to be used to pay for the PSAT for 8-10 graders. Under the proposal, as explained by Superintendent Mark Johnson, teachers would purchase materials and then submit them for reimbursement through the ClassWallet app. It is not clear how the use of ClassWallet would be paid for in the bill. A companion bill is expected to be filed in the House by Representatives Elmore (R-Wilkes) and Horn (R-Union) in the coming days. SB 609: K-12 Scholarship Changes (Senators Ballard, R-Watauga; Clark, D-Hoke; Johnson, R-Union) makes changes to the eligibility for the Special Education Scholarship, the Opportunity Scholarship, and the Education Savings Accounts. All three programs are changed so that students who do not meet the age eligibility for kindergarten but are at least 4 years old and “deemed by a non-public school to have the maturity to justify admission” may receive an award. was enrolled in a nonpublic school the spring semester of the previous school year but was enrolled in a public school for the entire school year immediately preceding that. Opportunity Scholarship: (1) Increases the income eligibility from 133% to 150% of the amount required to qualify for free or reduced-priced lunches, and (2) eliminates the restriction on the amount of total funding that can be awarded for K-1 students. SB 639: Education Funding Transparency (Sen. Edwards, R-Henderson; Ballard, R-Watauga) would require a number of changes to budget submissions to county commissioners and annual audits. It is critical that school board members work with their superintendent and finance team to develop a clear picture as to what this will look like in your school system. It is important to note that G.S. 115C-429(c) already requires local boards of education to provide, upon the request of county commissioners, “all books, records, audit reports and other information bearing on the financial operation” of the school district. It is not clear, given this statutory requirement, why most of this bill is necessary. It should also be noted that Section 1111 of ESSA provides fiscal transparency by requiring States to include in the report cards “per-pupil expenditures of federal, state and local funds, including actual personnel expenditures and actual non-personnel expenditures of Federal, State and local funds, disaggregated by source of funds for each local education agency and each school in the State for the preceding year.” This new federal requirement will be implemented for the 2018-19 school year. Given this new requirement, it is not clear what additional information will be gleaned that will not already be available through the report card process. Before addressing the specifics of the bill, it is important to understand the complications in developing school budgets in NC. School budgets are primarily comprised of three pots of funding: local, state, and federal. The federal fiscal year begins October 1, so school districts do not receive their federal funds until after that date. The State and local fiscal years both begin on July 1. However, since the General Assembly does not typically adopt the state budget until around July 1 (and in some years substantially later), school boards must develop their budget, which must be submitted to county commissioners by May 15, based upon planning allotments provided by the NC Department of Public Instruction. Section 1: This section changes the standard uniform budget format provided by the State Board of Education and seeks to breakdown local funds for personnel and operating expenses by individual schools. Currently, school districts do not necessarily budget by school. Some functions within a school district do not lend themselves to being assigned to individual schools like transportation. Schools are typically allotted teaching positions but not specific dollars to go along with the position, since the state guarantees the state salary for a state paid teacher regardless of where they are on the salary schedule. Additionally, school districts may have several hundred unique local report codes that would need to be standardized across the state to comply with this section. Section 2: This section requires the superintendent to “describe projected expenditures by program report code and object code” in the proposed budget. This requirement would impose a tremendous amount of detail on the budget process. The Uniform Chart of Accounts for state and federal funds lists 19,620 fields of information at the fund/purpose/program code/object code level. The CTE program (Purpose 5120), for example, has 38 program report codes (PRCs) and 727 potential fields. These numbers (19,620 and 727) do not include any of the hundreds if not thousands of local codes. In many of our districts the finance team in the LEA is extremely small and may be as few as two people. It would be a tremendous amount of work to produce a budget request down to this level of detail. Additionally, given the likelihood of numerous changes after state and federal funds are approved, it does not appear to be a wise use of limited resources. Section 3: The first part of this section would require that the budget submitted by the board of education to the county commission report “projected expenditures by program report code and object code.” This requirement would inundate commissioners with budget detail. Again, S. 115C-429 (c) already gives the county commission authority “to call for, and the board of education shall have the duty to make available to the board of county commissioners, upon request, all books, records, and other information bearing on the financial operation of the local school administrative unit.” Furthermore, under G.S. 115C-436(a)(4) the School Finance Officer is required to prepare and file a statement of the financial condition of the local school administrative unit as often as requested by the superintendent, and when requested in writing with a copy to the superintendent by the board of education or the board of county commissioners.” This section would require a level of budget specificity that most county commissions do not have the desire to get to, and for those that do, there are other mechanisms at their disposal. The second part of this section expands the authority of county commissioners to appropriate funds by PRC. Currently, the county commission may appropriate funds at the purpose and function levels. The PRC is the next level of specificity. Coupled with the next section (see below), this could restrict school districts from being nimble and responsive to the needs of the district. Section 4: If there is an increase or decrease of 25% or more within any PRC this section would require that the county commissioners would need to approve such a change. Under current law this requirement is only if the change is at 25% or more at the purpose or function level. School boards would first have to approve the budget transfer and then get approval by the county commissioners. Dependent upon the timing of the county commission meeting schedule, this could tie the hands of the school board from making necessary and time sensitive decisions that impact the operations of a school or school system. Sections 5 and 6: These sections make significant changes to the school district audits. There are already very strict auditing standards for public bodies put in place across the nation that are approved by the Governmental Accounting Standards Board (GASB). The requirement that the audit be performed to the object code level would substantially increase the expense and time required to complete the audit. Section 6 also requires the local board to provide a copy of the audit to the State Board of Education within 60 days and that the Department of Public Instruction post it on its website. In summary, this bill would create a substantial increase in cost and workload for an already taxed central office finance department. As a duly elected governing body, school boards need to be able to act nimbly to be able to address the financial needs within a school district to best serve the needs of the students in the community. New federal reporting requirements should provide additional transparency. If and when there is a need for additional information by county commissioners, a sufficient mechanism is already statutorily in place. An amendment was added by Senator Ballard (R-Watauga) to SB 343: Changes to Education Reports requiring LEAs to report the start and end dates for the instructional calendar by April 1 of each year. If a school is starting earlier than August 26, the local board must report the statutory exception authorizing the start date. This bill is on the Senate calendar for Monday night, April 8. Now Senator Ballard has filed SB 613: School Calendar Accommodation/Statewide, which would move the start date for public schools from the Monday closest to August 26 to August 16. If August 16 falls on a Saturday or Sunday, then schools could start the preceding Friday or the Monday after. The school year would need to end no later than June 1, unless that day is a Saturday or Sunday in which case the school year could end on Friday or Monday. Weather waivers would move from August 16 to August 9. NCSBA’s current position, along with the position of L.O.C.A.L. (see below), is one of “cannot support.” While this bill provides some limited relief, the bill does not provide enough. School districts would be required to have unequal semesters in order to get exams in before the winter break, and the bill does not address the issues of summer learning loss at all. It is our firm belief that if this bill passes there will be a limited chance for many, many years to come to rectify these important educational issues. The synergy around the issue will dissipate, legislators will not want to deal with it again, and the tourism lobby will say they have already compromised. While we do not oppose the legislation, it is important that we be able to advocate for additional changes in the future. L.O.C.A.L. (Let Our Calendar Authority be Local) is a coalition of organizations that has worked on school legislation for the past four legislative sessions. The member groups include, NCSBA, NCASA, NCAE, NCPTA, Freedom Works, the John Locke Foundation, the NC Justice Center, the Association of County Commissioners, and the Wake Education Partnership. This bill would makes change to the Educator Preparation Program, including adding consideration of the two-year retention rate for individuals who completed an EPP and became licensed and employed in a NC public school to the list of performance standards. This bill would create the Joint Legislative Study Committee on the Sustainability of the North Carolina State Health Plan to examine the needs and concerns of recipients of the state health plan for teachers and state employees and adopt new practices that promote health and incentivize participation. This bill would transfer the adoption of school textbooks from the State to the LEAs, as well as provide guidance in the selection, adoption, and evaluation of instructional and supplemental materials. This bill would require public school buildings, as well as other public buildings, to reduce energy consumption per gross square foot. Starting in 2002-03, energy consumption was to be reduced by 20% by 2010, 30% by 2015, and now 40% by 2025. This bill would eliminate the NC Final Exam as a way to assess teacher performance and growth, replace EOGs with a through-grade assessment model, replace EOCs with the ACT or another nationally recognized assessment of high school achievement, prohibit standardized testing by LEAs except when required by the State Board, and prohibit graduation projects as a condition of graduation. be provided by NC Association of School Administrators, NCSBA, School of Government at UNC CH, or other qualified sources. The bill would also give school finance officers the same terms and conditions of employment as assistant and associate superintendents, as outlined in subsections (b) and (c) of G.S. 115C-278. Read our issue briefs on Ethics Training for School Administrators (click here) and School Finance Officers (click here). This bill would allow retired teachers to work in Title I schools or schools with D or F grades without risking impact on their retired teachers’ benefits. The contract between the LEA and the high-need teacher would last no longer than one school year, and the teacher would make an annual salary of $35,000-$40,000. On April 2, the House Appropriations Committee on Education issued its Target and Budget Guidance. The Education Committee target appropriation for FY 2019-20 is $13.94 billion or $94.6 million above the base budget. The FY 2020-21 target appropriation is $14.13 billion or $208.8 million above the base budget. From this target, the Committee has to fully fund enrollment growth (K-12, Community Colleges, and UNC), Opportunity Scholarships annual statutory increases, and Program Enhancement/class size positions. After deducting mandatory expenses, the Committee has only $45 million in FY 2019-20 and $75 million in FY 2020-21 to spend on expansion requests. The Chairs of the House Appropriations Committee on Education will report their budget decisions to the Full Chairs on April 8. The Education Appropriations chairs will present their money and provision reports to the Full Chairs on April 11. The Full Chairs will make final decisions on the Education budget report by April 17. The Education Appropriations Committee will meet on April 25 to consider and adopt the budget report. This month the State Board of Education covered numerous topics including revising standards for K-12 social studies, elimination of select NC final exams, and licensing out-of-state teachers. The majority of discussion occurred during the presentation of the legislative update and Senate Bill 580. This bill would reimburse teachers up to $400 for the purchase of classroom supplies. While Superintendent Johnson expressed his support of the bill, many board members and advisors disagreed and emphasized that this bill would be taking $37 million away from LEAs. Freebird McKinney and Lisa Godwin, both previous teachers of the year, expressed their concern that the bill offers no additional funding to school districts. While Chairman Davis and Dr. Oxendine did not express direct support for the bill, both commended the NC General Assembly for recognizing LEAs need for sufficient classroom supplies. SB354: Student Notice/Charter School Closure/Restr. HB 315 would transfer the adoption of school textbooks from the State to the LEAs. By doing this, the scope of challenges to instructional materials by parents, teachers, and any citizen that deems the materials as “unfit” would expand. Many LEAs do not have the same expertise and resources as the State to evaluate and adopt textbooks. LEAs would potentially have to hire outside experts, which could place a financial burden on the districts. Or teachers would have to add this task to their workload, which would likely require additional compensation. LEAs already have the authority to adopt textbooks outside of the list adopted by the State Board of Education under S.115C-98(b2)(1). If LEAs are responsible for purchasing instructional materials, the price will likely increase because each LEA does not have the same bulk purchasing power as the State for physical materials and licensing rights. LEAs are more likely to see an increase in challenges to the material. Challenges to “unfit” materials would also likely increase with eligible challengers including any citizen, not just those with a direct interest in the material. It is not clear how the courts would apply the Board of Education v. Pico (1982) decision to challenges to instructional material that would be permitted under this bill. The Pico decision stated that library books cannot be removed because of objections to ideas expressed in the materials. Clearer terminology should replace the current “educationally unsuitable” language in this bill, which could allow for more subjective challenges. Rather than “educationally unsuitable” challenges, challenges should be limited to material that does not align with the standard course of study. If a challenge to the instructional material is upheld, the material must be removed instead of replaced. This bill should also allow LEAs to provide alternative materials to offset challenges to current materials. HB 315 is scheduled to be heard in the House Education K-12 Committee meeting at 1:00 pm on Tuesday, March 26. If you have concerns about this bill, contact your Representative prior to the committee meeting. Click here to view committee members. SB 5 allocates the State Capital and Infrastructure Fund (SCIF) to State agencies, institutions of higher education, and local school administrative units on an equal 1/3 basis from 2019-20 to 2027-28. A significant feature in HB 381 is specific allotments for each LEA, but there is no explanation of how the amounts were calculated. SB 5 requires no local match, but HB 381 requires a local match based on county economic tiers. SB 5 restricts funding to LEAs that are not class size compliant, but HB 381 does not. SB 5 increases the percentage of the General Fund appropriated to SCIF, but HB 381 does not. Schools would receive two separate grades, one for student achievement and one for student growth. Student achievement would be measured on a 15-point A-F scale, and school growth would be measured on a 10-point A-F scale. The definition of low-performing schools would no longer include schools with school growth scores of “met expected growth”, only schools with a grade of “D” or “F” and “not met expected growth”. School performance grades would be 50% school achievement and 50% school growth. The school performance grade would be measured with a 10-point A-F scale. The committee also approved HB 200: Education Report Changes and HB 295: Prohibit Corporal Punishment in Public Schools. All bills are scheduled to be heard in House Rules Committee meeting on Monday, March 25 (see legislative committee meeting schedule below). The House Education Committee chairs stated that they wanted to offer several alternatives to solve the school grading issue. Read our issue briefs on School Grades (click here) and Low-Performing Schools (click here). SB 319 (identical to HB 354) would modify the school performance grade formula to be 50% school achievement and 50% school growth. The overall school performance would be measured on a 10-point A-F scale. Click here to read our issue brief on School Grades. So far this session, the Senate has introduced 16 local school calendar bills, and the House has introduced 37 local school calendar bills and 4 statewide school calendar bills. The 53 local bills cover 85 LEAs. NCSBA has created this spreadsheet to track school calendar flexibility bills that are filed each week. Follow the LOCAL Authority for NC School Calendars’ Twitter account @nclocalcalendar to keep up with the progress being made for local school calendar flexibility. On Wednesday and Thursday of this week, the House overwhelmingly approved the placement of a $1.9 billion school construction bond on the 2020 ballot (click here to see vote). Representatives Brody, Bumgardner, Cleveland, Kidwell, Pittman, and Speciale voted against the placement of the bond on the ballot. An approved committee substitute clarified the matching requirements on page ten lines 14-16 of the bill: “A county shall not be required to provide local matching funds for the bond proceeds if any portion of the proceeds results from low-wealth county or adjustment factor designation allocations.”, as well as a rounding error that was off by $4.00. If approved by the Senate and signed by the Governor, this bond would give $1.5 billion to North Carolina public schools for construction needs, as well as $400 million to the University of North Carolina system and state community colleges. HB 79—A statewide bill sponsored by Representatives Horn, R-Union; Johnson, R-Cabarrus; Elmore, R-Wilkes; and Strickland, R-Johnston that would allow LEAs to determine opening dates of public schools based on the opening dates of community colleges serving their county. HB 117—A bill sponsored by Representatives Warren, R-Rowan; Horn; Howard, R-Davie; and Johnson that would establish a 3-year pilot program in 22 counties, allowing schools to open no earlier than the Monday closest to August 10 and close no later than the Friday closest to June 11, starting in either the 2019-20 or 2020-21 school year. The purpose of the pilot program is to determine the impact of the program on student achievement and the effect on the travel and tourism industry. Both bills have been referred to the House Rules Committee. Tuesday, March 12 – Staff from the Office of State Budget and Management (OSBM) presented the Governor’s Recommended Budget for Education for FY 2019-21 (click here for presentation). The Governor’s proposed budget would add $567.8 million to the Department of Public Instruction (DPI) budget in FY 2019-20 and $843.3 million in FY 2020-21. Thursday, March 14 – Eric C. Davis, chairman of the State Board of Education, presented the 2019 Legislative Expansion Budget Proposal for DPI, the State Board, and Superintendent Johnson (click here for presentation). Chairman Davis compared the Governor’s proposed budget to the joint departmental budget. There are many areas of agreement between the two proposals. Superintendent Mark Johnson presented the highlights of his #NC2030 plan to the Committee (click here for report). The Superintendent emphasized his proposed five percent teacher salary increase over the biennium and the addition of compensation for first through fourth grade teachers for professional development at the beginning of the school year. Click here to read our issue brief on School Finance Officers. HB 362 would make permanent a 15-point scale for school performance grades. This bill is identical to HB 145, which was filed earlier this session. SB 244 would allow teachers and instructional support personnel with master’s degrees to be paid on the “M” salary schedule or receive a salary supplement for their academic preparation at the six-year or doctoral degree level. SB 28, which would restore master’s pay for certain teachers, was filed earlier this session. So far this session, the Senate has introduced 16 local school calendar bills, and the House has introduced 36 local school calendar bills and 4 statewide school calendar bills. The 52 local bills cover 85 LEAs. You’ll also have the opportunity to visit the legislative building to observe session and visit with and/or meet your delegation for dinner, and much more. The $1.9 billion bond bill made considerable progress in the House this week. Speaker Tim Moore and cosponsors Jeffrey Elmore, Craig Horn, and Linda Johnson guided the bill through passage of four House committees – Education K-12, Finance, Appropriations Capital, and Rules. The bill was amended in Education K-12 to move the bond referendum from November 2020 to March 2020. The bill advanced to the House floor on March 6 but was returned to the Rules Committee on March 7 for further review. The bill will be debated again in House Rules on March 11 at 3 pm. It is anticipated that the House will vote on HB 241 next Wednesday and Thursday. Expansion of the NC Teaching Fellows Program to all institutions with an approved educator preparation program and to all licensure areas. Three bills recommended by the House Select Committee on School Safety were approved by the House this week and sent to the Senate. HB 75 School Mental Health Screening Study – The House Rules Committee added section 2(k) “A review of the best practices of other states that perform mental health screening of school-aged children” to the proposed study. 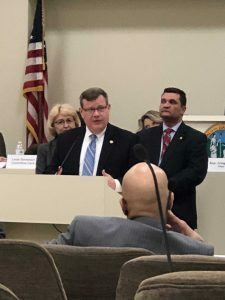 HB 76 School Safety Omnibus – The House Committee on Education K-12 made several changes in the original bill to address concerns expressed by NCSBA. Three further amendments suggested by NCSBA were adopted on the House floor. House Bill 216, School Self-Defense Act, sponsored by Representatives Pittman, R-Cabarrus; and Speciale, R-Craven; authorizes certain school staff and volunteer school resource officers who possess a valid concealed handgun permit to carry a handgun on school grounds and to respond to acts of violence or an immediate threat of violence. Read the linked bill for more details including training requirements. Senate Bill 192, School Safety Act of 2019, sponsored by Senators Daniel, R-Burke; Hise, R-Mitchell; and Tillman, R-Randolph creates the position of Teacher Resource Officer. It establishes a grant program and provides a salary supplement of 5%. The bill allows up to 3,000 Teacher Resource Officers statewide and budgets a recurring $4.5 million. Bills arming teachers pop up every year in the House. House leadership has not had much of an appetite to hear those bills. It has not been much of an issue in the Senate in recent years. It’s worth noting that two of the three senate sponsors are considered in the leadership circle, Hise is the Deputy President Pro Tempore and Tillman is the Majority Whip. Read the linked bill for more details including certification requirements. We encourage you to share your views with House and Senate leadership and your legislative delegation. SB 170, Expand Principal Bonus Multiplier Eligibility, fixes a principal bonus issue that NCSBA has been working on since last summer. The bill filed by Senate Education Chairs Tillman, Ballard, and Horner clarifies a provision in last year’s budget bill that essentially penalized some high performing principals for being too effective. Principals in a D or F school that that were in the top 50% of the statewide growth percentage during the 2017-18 school year were to receive a double bonus (see chart below) during the 2018-19 fiscal year. However, based on the wording of the provision, DPI’s interpretation was that principals who improved a D or F school to a grade of C or better in 2017-18 were not eligible for the double bonus. SB 170 makes those high-flying principals eligible for the double bonus and extends the deadline for them to receive payment. Note: A long term fix is still necessary. This bill only affects results from 2017-18. 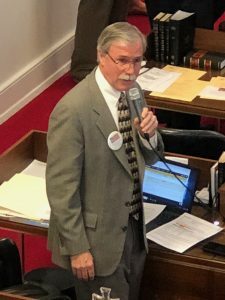 Sponsored by Representatives Riddell, R-Alamance; Fraley, R-Iredell; Clemmons, D-Guilford; and Ross, R-Alamance, the bill modifies the definition of a low-performing school to no longer include schools that “met expected growth”. The current definition of a low-performing school is any D or F school that met expected growth or did not meet expected growth. The bill also modifies which schools are eligible to adopt a reform model, including the Restart model. It considers the proposed changes to the new definition of a low performing school so that schools that were eligible for a reform model under the old definition are still eligible under the new definition. Click here to read our issue brief on Low Performing Schools. Click here to read our issue brief on Ethics Training for School Administrators. Part I of this bill requires partisan elections to be held for county boards of education and city boards of education. This month, members of the State Board of Education spent a majority of their time discussing renewal recommendations for charters expiring in 2019 and licensure requirements for out-of-state teachers. Much of the conversation was centered around renewals for three Mecklenburg charter schools: Commonwealth High and Stewart Creek High, alternative high schools up for ten-year renewals, and Charlotte Learning Academy, which was up for nonrenewal. On Thursday, the Board voted to grant the two alternative high schools seven-year renewals because of many members’ request for more accountability for schools whose students are mostly high school dropouts. The Board voted not to renew Charlotte Learning Academy’s charter because of the concern that granting any type of renewal to a school that has never had a school grade higher than a F and has 17.9% proficiency would set an unwanted precedent for future cases. Recently, State Board members have been debating the Professional Educator Preparation and Standards Commission’s recommendation of allowing out-of-state licensed teachers to come to North Carolina and teach without receiving a NC teaching license. Many view this as lowering the state’s teaching standards, but there is also an argument that it would allow quicker access to qualified teachers. The Board concluded discussion on this issue by requesting that DPI return to next months’ SBE meeting with an explanation of what resources it would need to provide comparability analysis of teacher evaluation data and student growth data of out-of-state teachers with in-state teachers. So far this session, the Senate has introduced 13 local school calendar bills, and the House has introduced 35 local school calendar bills and 4 statewide school calendar bills. The 48 local bills cover 81 LEAs. The Senate deadline to file local bills is next Thursday, March 14. The Senate deadline to submit/request a bill to legislative drafting has passed. The House deadline to file local bills is Thursday, March 28. The House deadlines to submit/request a bill to legislative drafting has passed. Speaker Tim Moore was joined by more than a dozen Republican House members at Thursday’s press conference to unveil HB 241, Education Bond Act of 2019. The proposed $1.9 billion bond for statewide school construction, if passed by the General Assembly and signed by the Governor, would put the issue before North Carolina voters next year. The proposal provides $1.5 billion to K-12 schools, and $200 million to both community colleges and universities. The bill allows LEAs to use the funds for new construction, renovations, technology, infrastructure, building security, certain types of equipment, and land if construction is to begin within twenty-four months. The breakdown of funds received by each LEA is based on a formula comprised of four components, which includes a $10 million dollar minimum per county. The largest percentage of funds is for low wealth counties, followed by ADM and ADM growth. Click here to see how your LEA benefits from the bond bill. Section 5 of the bill states that any funds from the bond used for school technology will be credited against the 2008 judgment in N.C. School Boards Assn, et al., v. Moore, et al., civil penalties (fines & forfeitures) lawsuit. “And let’s give our students safe, healthy places to learn. Right now, 4 in 10 public schools in our state are at least 50 years old. That means they’re still using the schools you and I went to. That’s great for nostalgia, but not so good for students in classrooms with unreliable heat, leaking roofs or crumbling walls. K through 12 schools need at least 8 billion dollars in new construction and renovations. There’s a smart way to build them that locks in financing against the whims of future legislatures and lets the people decide at the same time. The Committee met on Tuesday, February 26. Two of the school safety bills we mentioned in last week’s update were up for a vote, including HB 76 – School Safety Omnibus. The list of concerns NCSBA shared with committee members before the meeting were addressed in the bill’s amended version. It passed out of the House K-12 committee. HB 73 – Civic Responsibility Education also passed out of committee after it was amended. Both bills are now in the House Rules committee. The Committee met on Tuesday, February 26 and Wednesday, February 27 to hear presentations from the legislative fiscal staff on Introduction to Public School Funding (click here for slides) and Public School Allotments (click here for slides). So far this session, the Senate has introduced thirteen local school calendar bills, and the House has introduced thirty-four local school calendar bills and four statewide school calendar bills. The forty-seven local bills cover eighty LEAs. Thank you to the sixty-seven school boards and twenty-six county commissions that have shared their adopted resolutions with NCSBA in support of school calendar flexibility. Click here to see the full list of school calendar resolutions. Email a copy of your board’s calendar flexibility resolution to Richard Bostic at rbostic@ncsba.org. After adopting a resolution, school boards and/or county commissions should request that their legislative delegation file a local bill. If the response from the legislator is that the bill is dead on arrival, request that your delegation introduce the bill anyway. The Governor’s Commission on Access to Sound Basic Education met this week to discuss North Carolina teacher quality, teacher retention, and new programs that expand teaching roles. There was a panel discussion of teacher perspectives on the challenges of hiring high-quality educators in NC schools. The three panelists addressed their personal experiences, including lack of consistent leadership, human resources, flexibility, and autonomy. The panelists requested that the State promote more relevant and engaging professional development and shared visions of leadership. This led to the discussion of the lack of school calendar flexibility, which affects school districts’ ability to establish days specifically for teacher professional development. Commission members also heard from four different school districts that have implemented programs aimed to increase teacher effectiveness, not only in the classroom, but also with fellow teachers and administration. Staff members from the four districts promoted ideas such as accounting for career growth and recognition of excellence in teacher pay, expanding school leadership and authority, and creating teacher leaders that collaborate with school personnel to improve student learning and instructional support. Click here to access the meeting agenda and resources. Local and State Elected Officials, join the National Digital Inclusion Alliance (NDIA) and the North Carolina Broadband Infrastructure Office for the, “Closing the Digital Divide 101 for Local and State Elected Officials” workshop during pre-conference sessions at Net Inclusion 2019. This workshop specifically designed for local and state elected officials will cover digital equity and inclusion basics, ideas for supporting and launching local digital inclusion efforts, and ways to advocate for or implement policies to support digital inclusion and equity initiatives at the local, state, and federal level. This workshop is one of seven pre-conference workshops offered at Net Inclusion 2019. Learn more about the other workshops and the other great offerings at the conference here. The special reduced rate for Net Inclusion at the Omni Charlotte Hotel Starts at $175/night. The last day to receive the reduced rate is March 10. But the room block is likely to fill up before then. Register for Net Inclusion 2019! HB 74 continues five grant programs that were funded in the 2018-19 state budget. Click here to see a chart that breaks down the differences in funding levels and recurring vs. non-recurring dollars. HB 75 requires DHHS and DPI to study whether North Carolina should require a mental health screening process to identify school-age children at risk of harming themselves or others. Requires each school to annually complete a facility vulnerability assessment. There is an inconsistent use of the word “threat”. In some places it is used to mean a “threat”, and in some places it is used to mean “risk”. There are several inconsistencies in the bill with the requirements of FERPA. There are no immunity protections if the threat assessment team determines that a student is a lower threat than they actually are. There is an inconsistency between the schools establishing threat assessment teams based on policies recommended by the Center for Safer Schools and when the Center has to have their model policies. Threat assessment policies adopted by public schools are public record. Should they really be a public record? What happens if a student is referred to health care professional and the parent or student refuses? Is it really workable for a county LEA to establish an emergency plan for all public-school units in the county? We hope that many of these concerns will be addressed in a proposed committee substitute that will be presented to the House Education Committee on Tuesday, February 26. Senate Bill 5 – The Senate approved SB 5, a pay-as-you-go school construction funds bill, on a 33-14 vote on Wednesday. Senate Democrats offered three amendments to the bill, including an attempt to transfer future Opportunity Scholarships expansion funds into public school construction, but those efforts failed. House Bond Bill – Speaker Moore’s proposed school bond bill has not been introduced – yet. We are hopeful that the bill will be filed next week. 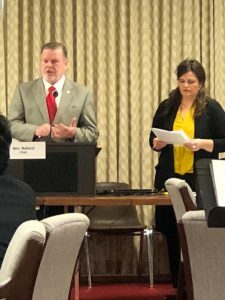 Senate Democrats – In a press conference on Wednesday, Senate Democrats voiced support for the planned House bill for a school construction bond and opposition to SB 5 (Four Democrats did vote with the majority on SB 5). They intend to file their own bond bill soon. Tax collections for the current fiscal year are projected to be $151 million (.6%) above the revenue forecast of $23.9 billion. Sales tax collections are up $117.8 million (1.5%). Part of the increase is attributed to the verdict in South Dakota v. Wayfair, Inc. that requires internet companies to collect sales tax. Personal income taxes are projected to be $53.3 million (-.4%) below projections, due to the impact of the Federal Tax Cut and Jobs Act. Business taxes are $16.5 million (.9%) above projections. For the FY 2019-21 biennium, legislative and executive branch staff project economic growth of 3% in FY 2019-20 and 4% growth in FY 2020-21. Sales tax growth is estimated to be 3% in FY 2019-20 and 4.6% in FY 2020-21, due to the continued implementation of sales tax collections on internet purchases. Personal income tax collections are projected to grow 1.9% in FY 2019-20 and 4.0% in FY 2020-21, due to strong wage growth of 5.1% to 5.3% each year. In FY 2019-20, the General Fund Revenue availability is $24.814 billion. For FY 2020-21, revenue availability is $25.801 billion. After reserving funds for the State Capital & Infrastructure Fund and the Savings Reserve, the revenue available for expansion budget needs will be $572 million in FY 2019-20 and $1.39 billion in FY 2020-21. This may seem like a large amount until you view the list of “must do” items shown below. For the remaining funds, consider that each 1% increase in public school teacher and instructional support salaries cost $61.8 million. The NCSBA Legislative Public Policy Conference is scheduled for April 30/May 1 in Raleigh at the NCSBA building. The agenda is still under development, but we are securing a legislative education panel of two State senators (one committee chair) and two House members (one committee chair). Other sessions include an analysis of the real impact on summer learning loss and potential remedies, along with state evaluations on Read to Achieve and the Innovative School District. Also, since the General Assembly is in session during our conference, you will have an opportunity to see them in action and visit with your legislative delegation. The early bird registration rate for the conference is $250 through February 28, and the normal registration rate is $325 starting March 1. Click here to register. So far during the 2019-20 legislative long session, the Senate has introduced twelve local school calendar bills, and the House has introduced twenty-seven local school calendar bills and two statewide school calendar bills. The thirty-nine local bills cover seventy-one LEAs. Thank you to the sixty-three school boards and twenty-two county commissions that have shared their adopted resolutions with NCSBA in support of school calendar flexibility. Click here to see the full list of school calendar resolutions. Email a copy of your board’s calendar flexibility resolution to Richard Bostic at rbostic@ncsba.org. After adopting a resolution, school boards and/or county commissions should request that their legislative delegation file a local bill. If the response from the legislator is that the bill is dead on arrival, request that your delegation introduce the bill anyway. 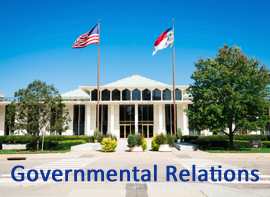 The NCSBA Governmental Relations staff has written issue briefs for each topic in the 2019-20 Legislative Agenda. They can be accessed on the NCSBA website under the Governmental Relations tab or by clicking this link. View our final brief on Student Support Personnel. H72: Support Multiple Recesses for Lincoln Co Schl. The Senate Appropriations/Base Budget Committee approved Senate Bill 5, Building North Carolina’s Future, after extensive debate. While bill sponsors praised the pay-as-you-go approach, several senators pointed out that there is no guarantee that future General Assemblies will stay committed to this plan and that project funding is at the discretion of the Superintendent of Public Instruction. The bill will be heard next in Senate Rules Committee on Tuesday morning, February 19, at 9 am. So far during the 2019-20 legislative long session, the Senate has introduced four local school calendar flexibility bills, and the House has introduced seventeen local school calendar flexibility bills and one statewide school calendar flexibility bill. The twenty-one local bills cover fifty-one LEAs. Thank you to the fifty-five school boards and eighteen county commissions that have shared their adopted resolutions with NCSBA in support of school calendar flexibility. Click here to see the full list of school calendar resolutions. For boards in need of assistance, this packet provides sample resolutions and draft bills that can be used in discussions with your legislators. Please email a copy of your board’s calendar flexibility resolution to Richard Bostic at rbostic@ncsba.org. The NCSBA Governmental Relations staff is writing issue briefs for each topic in the 2019-20 Legislative Agenda. They can be accessed on the NCSBA website under the Governmental Relations tab or by clicking this link. View our most recent briefs on School Finance Officers and School Technology. The site also includes links to specific pages on the NC Legislature website, as well as a tab containing information about elected officials.